I keep all together on my studio shelf. probably has been around the longest of anything that I collect. for her Collections Show and Tell Party this week. hiding in many of my Fall vignettes. that my daughter bought for me several years ago. Most of the figurines are vintage Lefton. These two on my front porch started it all. and a silver art deco/modern piece from my older daughter. Sorry it's blurry, I grabbed this photo quick. 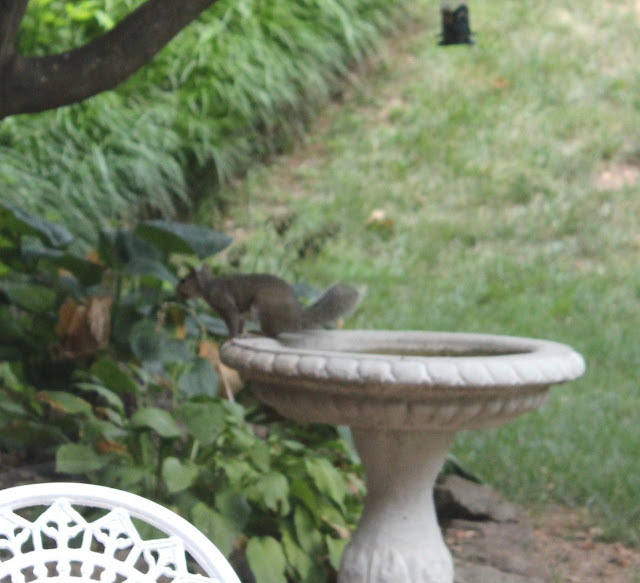 We have an abundance of both squirrels and chipmunks. I feed the birds so they enjoy the leftovers. The kitties would love to "enjoy" them. 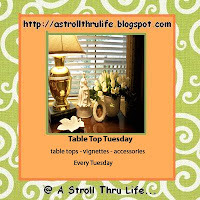 Hope you'll join Suzanne for the linky party starting Tuesday July 26. You have so many wonderful collections! This one is adorable! HI Debra, I LOVE your squirrel collection. 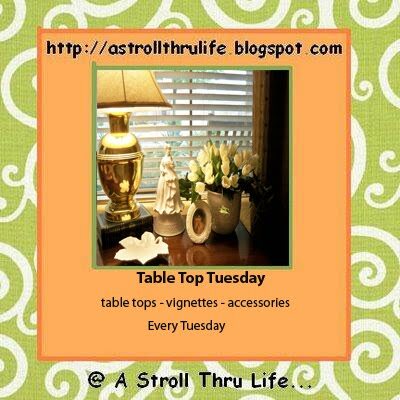 I have a few that I love that I bring out with my fall decor...a few scattered leaves...etc. What a wonderful variety you have too. Great pic of the real one at the end. We have several on our property. They get into the chicken pen in the barn, they love chicken feed. Hahaha...you can hear the chickens make lots of noise when the squirrels get in there...oh my! I love squirrels! Isn't it funny how an item you pick up or receive as a gift will start you on a collection. I'm kind of like that with dolls. Love your entire collection, but the paper mache' box and that card are just wonderful! HI Debra! What a great collection of little squirrels! You have some darling ones. You have a very nice squirrel collection, love the lefton ones! my youngest just received a little 'stuffed' squirrel for her birthday from her grandpa. she named him 'jimmy' after a little guy who liked to come through the window screen at the cottage we rent each summer. we even resorted to buying him peanuts in the shell, in the hopes of keeping him outside (at a little planter). it didn't work. talk about surprising. Ha, I bet the kitties would... we had that awful kitty we adopted and had to find a new home for because he didn't like Jesse. Anyway that cat loved the chipmunks and brought one in the house one day. I corned the poor little scared thing in the small bathroom downstairs and it was just me with a bug net and him, that (not so little) thing repelled off my chest to the wall and on top of my head! He was leaping at me and I was screaming while my daughter was laughing on the outside of the door. I never did catch the little bugger, my daughter ended up blocking all the entrances to the bathroom and the front door, when we opened the door he ran to freedom. I never knew there were so many sqirrels to collect. Yours are wonderful! Your collection is adorable! The chipmunks are my favorite. I love your collection of squirrels, they make me homesick for the huge oaks at my old house that was home to many a squirrel. Thanks for sharing your collection with us. Such a sweet collection! Squirrles are soo cute. I love watching the run about the garden! Do forgive, Its been eons since my last visit! You DO have a chipmunk collection! How cute!! Debra, Your chippies and squirrels are the cutest! What a fun collection. I'll bet you smile every time you look at them. Hugs and Love and a "Squirrely" Bus! What a great collection, Debra! I think they are darling little critters. I once rescued one from the spokes of my son's bike and although I got bit, it was worth it, the poor guy. Family and friends like to give me a hard time about it, but I think anyone would have done it!! If you have a Dollar Tree, right now in the Fall stuff they have an adorable squirrel. You would like it! Love your collection-I bet they are fabulous in fall decorations. Your squirrels are so cute! :D I think it's neat to have things around us we love while working. Why am I just now finding out about this collection??? What a cute collection, Debra. I love hearing about other people's collections, since their usually connected to memories. Oh my...these are all sooooo darn CUTE!!! What a wonderful and awesome collection you collected here. First three are is adorable, really like it very much. very desk where I blog. others can enjoy it, too! Since squirrels and I share a love/hate relationship, it should come as no surprise I spotted your collection right off the bat! I have a hunch your collection is going to grow with this revelation about yourself. What a fun collection you have! I really love that basket and the majolica planter... you do realize that now that we all know about your collection, you will probably we receiving chipmunks and squirrels in your mail from total strangers?!? oh they're precious! 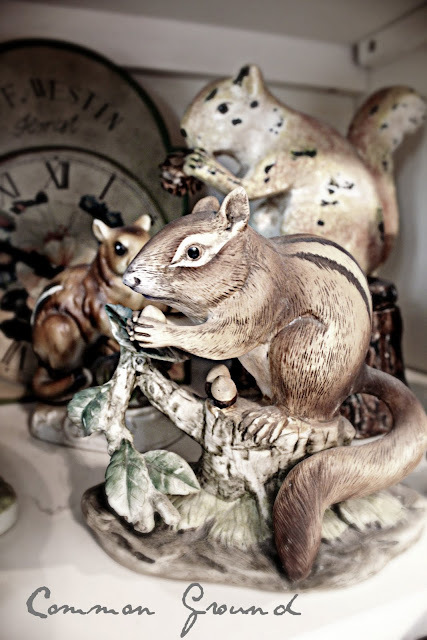 i love this collection and so miss the squirrels we used to have in the old established neighborhood. now it's all about the turkeys. I adore your paper mache white squirrel! We have white squirrels right out my back door. They are albino and our town is full of them. It is illegal to run over them, not that I would but, you have to stop for them in the street. I had to wait fore a baby one last week to stroll down my street. It couldn't decide what it wanted to do at all. We always enjoy watching them. I have pics of them on my site. Very cute collection! Debra, Every time I see a squirrel from now on I am going to think of you. You have a great collection. It is so much fun collecting the things we love . . . thanks for sharing this part of your collection.